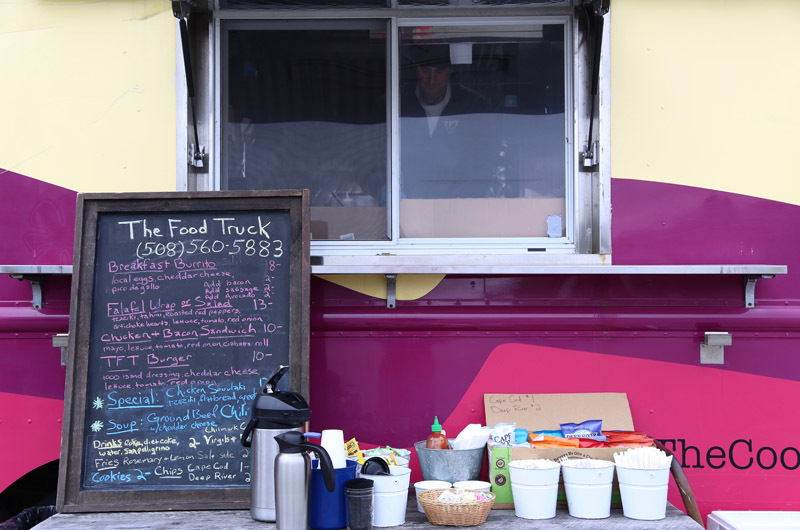 The Food Truck is open for lunch Monday through Friday in the Home Port parking lot in Menemsha. An order came in by text message. Two specials (that day it was chicken souvlaki) and a side of fries. Angela Aronie wrote it on a ticket and handed it back to her husband Josh who stood in the few feet of space between the prep counter and the grill in The Food Truck. Nearly everything is within arm’s reach for Mr. Aronie, whose tall frame fills the cramped quarters and yet he moves from prep counter to grill to fryer without awkwardness. "Is that one side of fries or two?" Mr. Aronie asked, looking down at the ticket. Mrs. Aronie said she’d call the customer, Al Hedin, and ask. “Oh if it’s Al, it’s one order of fries,” Josh said. This exchange is not uncommon in The Food Truck, which anchors one of the furthest outposts up-Island for a hot lunch in the dead of a Vineyard winter. 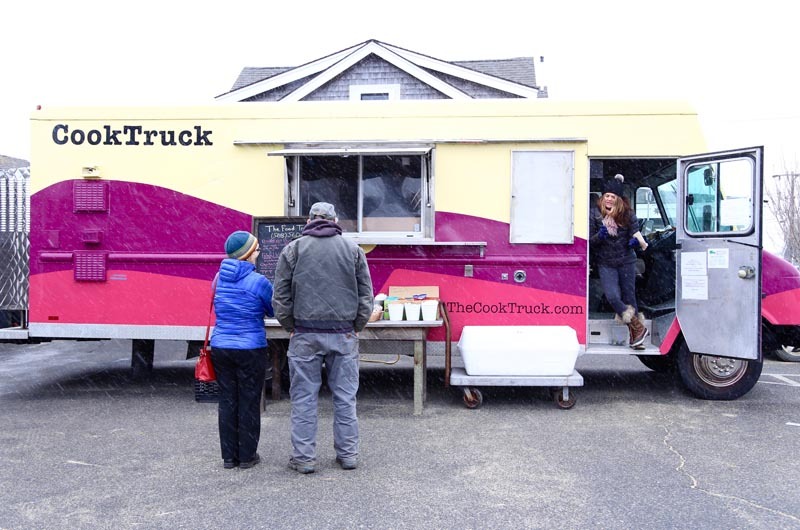 Mr. and Mrs. Aronie have been operating the truck for four years now, setting up at the Home Port parking lot in Menemsha and never straying far from simple, handheld, comfort food served rain, snow or shine. They know most of their customers by name, by car and by order. “If they haven’t called ahead and we see people pulling up, we’ll start making what they want,” said Mr. Aronie. On a recent Tuesday, parking lot was largely empty as Mr. and Mrs. Aronie stationed themselves in the truck; Angela is the front of the house and Josh is the back. Orders came in mostly over the phone. The couple also puts out a dish of chicken for the stray cats that stalk the perimeter of the lot. As the noon hour approached, a procession of cars swooped into lot and the customers, mainly up-Island tradesmen, stopped by to grab something hot for lunch. The menu is designed for people on the move. “It’s not a sit down thing . . . it’s designed to eat on the run,” Mr. Aronie said. He conceded that some of the dishes can get messy, especially if they are saucy. For the falafel wrap, for instance, he suggests a peel-down-and-eat method. “You can’t take off the wrapper,” he warned. Some customers left their engines running as they jogged up to grab their food and returned to the heat of their car. Some drove off, food partially unwrapped in hand. Others sat in their cars and ate in the parking lot. It’s the one time of year where parking in Menemsha is easy to find. If the weather lingers above 50 degrees, customers will enjoy their lunches outside near the water, Mrs. Aronie said. But even in inclement weather, The Food Truck continues to serve and the customers continue to come. “If the roads are open we are here,” said Mr. Aronie. In the four years of operation, they’ve only been snowed out once, he said. It helps that the snow plow workers always plow the Home Port parking lot without being asked. It might be because the plow guys want lunch too, Mr. Aronie conceded. A lot of The Food Truck’s customer base works outside. From stone masons to landscapers and construction workers, anyone spending hours out in the cold needs the fortification of a comforting lunch. Toyota pickup trucks are the most common vehicle their customers drive, Mrs. Aronie said. 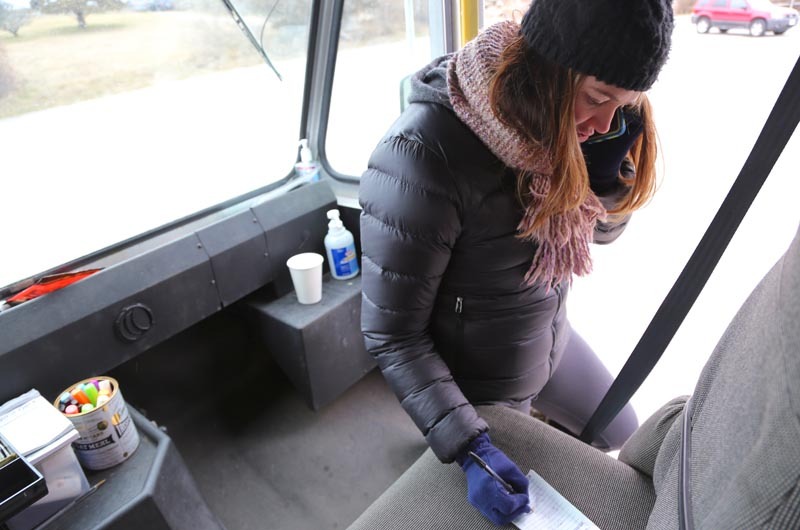 From her perch in the cab of the unheated truck, Mrs. Aronie, who is wrapped in wool socks, fleece leggings, a puffy jacket, hat and gloves, is the one-woman customer service team. She greets customers by name and asks about their family, their dog, their day. She calls it her social hour. Al Hedin arrived for the order he texted in (two specials and side of fries). The fries were for Esme, his three-year-old daughter who was sitting in the back seat of his van. “I smell french fries,” Esme announced as Mrs. Aronie passed the food through the car window. Mr. Hedin said The Food Truck’s lemon rosemary fries are the only ones Esme will eat now. He prefers the specials, himself. He’s been following Mr. Aronie’s food for years, Mr. Hedin said, and visits The Food Truck a couple times a week. “It’s always been good but it’s been getting better and better,” he said. The Food Truck is open only for lunch and only during the work week. There are a few staples (falafel, burger, breakfast burrito, chicken and bacon sandwich) with a rotating selection of soups and specials. Mr. Aronie keeps it simple. “It’s a burger. If it doesn’t look exactly perfect I don’t care. I don’t go, oh no, it’s not plated right,” he said. But he is selective, picking out the best pieces of chopped lettuce and putting aside a ciabatta roll with a deep air hole in it. “I don’t think that could even hold the burger,” he said, examining the roll. He is also respectful of the other proprietors in the area. For example, he won’t serve fish dishes, even though he considers them his specialty, because Menemsha Fish Market is still open in the winter. During summer, Mr. Aronie’s physical location changes just a few yards, from the parking lot to the kitchen, as head chef of the Home Port Restaurant. The summer crowds are large and relentless and he easily puts in 75 to 80-hour work weeks. Winter is much quieter, but his clientele just as eager. 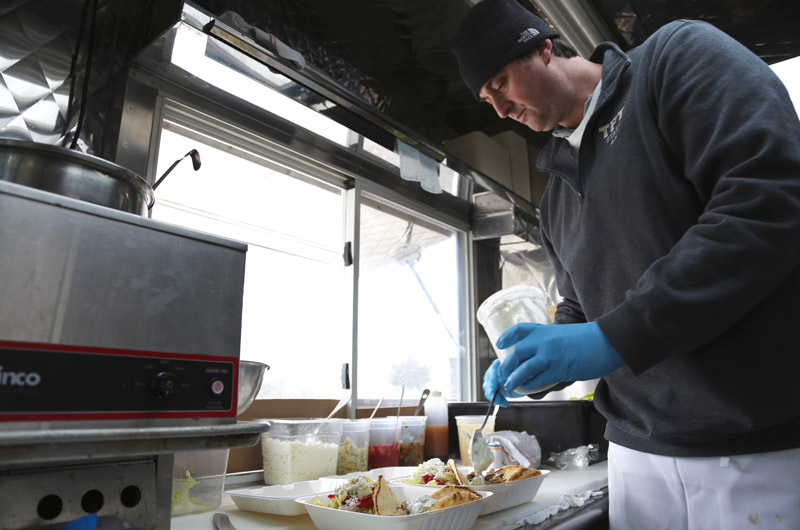 The Aronies hope to open a second, year-round food truck at the airport business park. The details haven’t been figured out yet, but they hope to have something up and running by May. However, they will always return to Menemsha in the off-season. For more information visit facebook.com/thefoodtruckmv or call 508-560-5883. Great article, but you forgot to mention how great the food is! Hi Rick, the phone number is 508-560-5883. The national news has been so grim lately. Reading this article today was a warm ray of sunshine. Thank you. So much of our island ethos that's subdued and tempered in-season is embodied and flourishes in and around The Food Truck. It's worth every moment of up-island travel to arrive at Angela's and Josh's. The food, the view, the raw winter ambiance. Lucky us. Impatiently waiting for Food Truck #2. A great place to break the tedious routine of winter. Beyond delicious! Great to have his culinary expertise treating us at the Homeport during the summer and the Food Truck during the winter blues.